Various leaves and other forms of flexible working arrangements have been implemented in workplaces to support employees with family commitments. Some are a response to public policy, others developed voluntarily. However, research examining the effectiveness of these policies in a search for “good practices” often neglects the impact of specific national and workplace contexts. Some researchers are calling for more attention to social systems, especially at the macro and meso levels, and the relationships between them, to extend understanding of work family processes and experiences. We argue that this is critical for evaluating work-family policies and practices. However it is important to recognize that social systems are not static. They are dynamic and changing, particularly in the context of globalization processes. 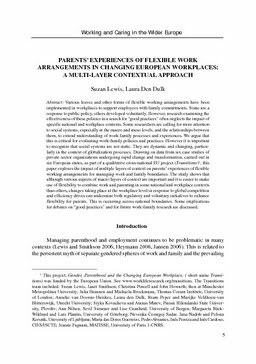 Drawing on data from six case studies of private sector organizations undergoing rapid change and transformation, carried out in six European states, as part of a qualitative cross-national EU project (Transitions)1 , this paper explores the impact of multiple layers of context on parents’ experiences of flexible working arrangements for managing work and family boundaries. The study shows that although various aspects of macro layers of context are important and it is easier to make use of flexibility to combine work and parenting in some national and workplace contexts than others, changes taking place at the workplace level in response to global competition and efficiency drives can undermine both regulatory and voluntary initiatives to enhance flexibility for parents. This is occurring across national boundaries. Some implications for debates on “good practices” and for future work-family research are discussed.